I first visited you when I was barely 2 years old. There was absolutely no memory of you except the thrill of going up and down on your many flyovers. You were special. Very special, because you brought my first ever stamp on my little blue diary! (Read: passport) And then years later I sat on a plane to visit you again. I had visited your neighbouring Emirate 3 years ago and I sincerely wished you would show me a traditional side of UAE. And you didn’t disappoint! 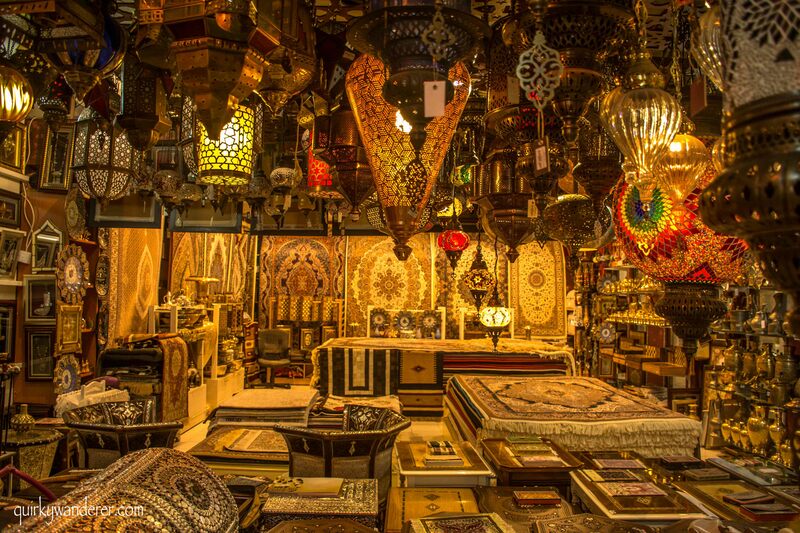 I walked through your Souqs and fell in love with the fragrances: of freshly brewed Arabic coffee , of the scentful Itar , of the freshly mixed Henna and of the various spices. The glitter of your Gold Souq and the old world aura of the Iranian market left me awestruck, while yellow bricked walls on the streets made me time travel and old alleys with carpet sellers and dainty lanterns made me relive Arabian nights. As I bit into a juicy date and sipped black Arabic coffee , I discovered a new way to drink coffee with natural sweeteners. You made sure I tried each and every kind of date in the Dates market and fall in love with every variety. Then there was the delectable Baklava. There was an ancient charm that enveloped you. In your Arabic architecture , ubiquitous mosques and heritage museums. You had rustic wooden doors and windows too! Much to my delight. Most of these tucked away in your fascinating lanes. In the Sharjah Heritage museum, you took me through age old Emirati traditions, right from a birth of a child to marriage customs and costumes to the death rituals. I walked past an exemplary display of the heritage of Sharjah with history seeped into each cubicle. Of traditional Emirati homes, of ancient trade routes, of mystical medicines, vibrant clothing, glittering, intricate jewellery and age old myths. It gave me a sneak peek into the life of an Emirati and their customs and for a moment I was taken back into a different era. And if this wasn’t enough, you enthralled me again when I visited the Heart of Sharjah. Strolling through Al Arssa Souq, Sharjah’s oldest market, I came face to face with shops selling brass ware, wooden antiques, jewellery, clothes and the likes. I could envision how it would be years ago, these bazaars buzzing with activity! While I awed at the arches, you silently smiled, waiting patiently for me to enter the Sharjah Museum of Islamic Civilisation. Inside the beige facades, were magnificent ochre corridors, thrilling the architecture lover in me. It was so huge that I could easily spent an entire day learning about Islamic culture, art and the melange of science and faith. This gallery held Islamic artefacts and rare historical Quran manuscripts. The pillars of Islam were explained with accounts of the Hajj pilgrimage. The most fascinating exhibit was the Kiswah, the black satin cloth which covers the Kaaba. The Ibn Al-Haytham Gallery of Science and Technology showcased the blend of faith and science, with Islamic contributions to astronomy, medicine, technology and engineering. A walk through the Islamic Art Galleries took me through artefacts : pottery, carved wood, textiles of the Islamic world as old as the 7th century. In each gallery there was something to see, value, appreciate. From art to architecture to history to culture. The highlight was the Islamic Coins Display and the dome with all the constellations, etched in stone. While I was busy raving about your traditional side, you acquainted me with the Al Jubail Fish market :a state of the art, modern AC fish market. My first ever visit to a fish market, let alone an AC one. Astounded at the hygiene, the entire process of bridging the gap between the buyer and the seller enfolded before my eyes as I wondered if this was a market or an administrative building! I chatted with the local fishermen, watched them in activity as they off loaded fresh fish into trolleys and wheeled it straight into the market. I saw the clouds darken and hover above as I entered the Sharjah Aquarium. Here is where ,you brought the kid in me alive. As I saw sharks flit in and out of their homes, a sea turtle swam in front of my eyes and my heart danced in glee. I walked through tunnels with marine life floating over me, one with the mysterious underwater world, in an urban setting, learning, getting acquainted with marine life on the Arabic coasts. There wasn’t a must see or must do list in my hand, yet I ended up discovering you in bits and parts. One day the absolutely classic Iranian mosque, the other day the Giant merry go round at Al Qasba. And of course the spectacular mosques spread across the city. From the magnificent Al Taqwa mosque at the Al Majaz waterfront to the grandeur of the Al Noor Mosque as it stood majestically overlooking the Corniche, built as a replica of the Blue mosque in Istanbul. You made me feel safe even at night, where I found the freedom of being able to walk about any worry. This feeling cannot be described! There was magic in your sunsets by the Corniche. The waterfront gleamed with golden reflections of the setting sun. Flocks of birds doing their evening rounds as a lone Dhow boat cruised in the orange waters. And then the evening Azaan filled the air with magic. What could be calmer than this scene. The birds returned back home, the sun gave in to twilight and people found solace in prayer at the end of the day? Dear Sharjah, You had something for everyone, for the devout, for the nature lover, for the history buff, for the art connoisseur and the compulsive shopaholic. But for me you had vibrant postcards: an array of colours, unexpected brushes of art spilled on the streets and magical moments that proved that Arabian nights wasn’t just a fairy tale I grew up believing in vain. Here is a video I shot in Sharjah that sums up the magic! P.S: My trip to Sharjah was sponsored by Sharjah Tourism Authority and Air Arabia, but needless to say the views in this article are my own. Thanks Marissa 🙂 The museum was one of the highlights! 🙂 Glad you liked the narrative. That would be a wonderful place to visit in my retirement. So unlike where I live! The place has its own charm. quite distinct from its famous neighbouring Emirate. Wow, look at those constellations…they look real! This is a nice way to Thank the city for its charm and hospitality. Is it cheap to buy gold there compared to India? The rate is more or less the same. But quality is without a doubt better. Great to read. Amazing pics. Loved the post. Quite a creative way to share these lovely photos. Goegrous pics Divi!! made me wish I could go on a trip like this soonest!! Thanks a lot Shalini. Hope you get to go soon. If you are an antique/ old world/vintage lover you will definitely love this place. This post left me as charmed as you were on visiting the place.Looks like it is a really great place to visit,and loved those antiques. Beautiful journey Divsi! It was like I was on a walk with you. Great pictures. This trip was memorable because of your splendid company 🙂 Thanks Indrani! What a lovely love letter to Sharjah ! I never ever thought anything of Sharjah till i read your post and saw the beautiful pics.! Sharjah? Never knew that there was so much in that expanse of dust and haze to the starboard of Dubai airport when climbing out of the city! I love that this post is an open letter to Sharjah, it makes it so intimate. Gorgeous and inspiring. The sunset on the waterfront in Corniche looks magical. Thank you so much for sharing. Thanks so much. The ochre sunset was one of my most memorable moments in Sharjah. You absolutely made me fall in love with markets of Sharjah and the stunning architecture… The colors and delicate engravings… I could almost visualize myself walking through the streets… Perfect postcard captures. And your narration is so well written. Thanks so much Rajlakshmi. Glad you liked the post 🙂 The place is beautiful and my pictures can’t do justice to the actual scene. Thanks Priya 🙂 The architecture is one of the highlights! It was a memorable trip indeed! Thanks Anin. The idea was to roll out a must do list in a unique way:) hehe. Yes a doors and windows series is pending. Absolutely love it! The photos are beyond awesome! Thank you for making me want to visit Sharjah! Such stunning pictures. Thank you for this in depth behind the scenes tour. It looks like you really immersed yourself in the local scene. Beautiful place and so close to Dubai! I love those old markets, souks full of oriental souvenirs and spices. The architecture looks amazing – I wish I’d known about Sharjah before I went to Dubai! Next time I’m there, I’ll definitely visit it! I enjoyed reading this blog. I like the way you have given a personal touch to the narrative. While returning from Jordan I had a long halt at Sharjah airport. I was curious to see Sharjah but was caged in the airport all day. It sure looked gorgeous from the aircraft. Thanks Abhinav! 🙂 Jordan is on my list 🙂 I am sure you ll like Sharjah, whenever you visit it. Wow! That’s a beautiful narrative!!! I’ve never been to any of the middle eastern countries yet. So thanks for this virtual tour. The souks look spectacular. I could spend all my day just admiring the jewelry, fabrics and those vintage items or rather I shouldn’t – I might just end up over spending!!! There is so much to do and see in UAE. Your all pictures are gorgeous and I couldn’t pick up a single one to say this is best. I can treat myself well here with so many beautiful souvenirs. Beautiful frames, Divya. Love the souqs and architecture. Beautiful pics Divsi…Thanks for making me all nostalgic again. Nothing seems to have changed but yet, there are a few changes that I can note. The architecture through your eyes is stunning indeed! Sharjah looks amazing! I would really like to visit it some day! I just love all these markets! Like a dream! Hope you get to 🙂 Thanks for dropping by! So beautifully written! The photography was incredible as well, it made the city come to life! I’ve never been to the Emirates but this post just made me realise how much I’m missing out! I can completely see why you love Sharjah. Your photos really made me want to go explore there. I also love Arabic architecture, especially those doors! I would definitely want to have some coffee and dates and relax there. So many amazing pictures! Thanks for sharing, I would love to visit it! It’s like a love story with stunning pictures. I enjoyed the way you described Sharjah’s culture and beauty. The Arabian coffee in the souqs really caught my attention. I could imagine the smell of the fresh coffee paired perfectly with sweet dates. I never heard of a fish market being inside of a building. I think I would prefer it to be outside to masque the smell of the fish! I loved all your photos and the mosques looked particularly stunning. Thanks for sharing. Thanks so much Riely! 🙂 I ‘d rather not enter a fish market (building or otherwise) , being a vegetarian 😛 But this was Absolutely well maintained! 🙂 Thanks for dropping by!! I love how you wrote this piece – making it very fun to read. Souqs seems like an interesting to place to try out the different fragrances. And the sunset by the croniche is stunning! I have been wanting to come here since the day it was published. Anyway, it’s better late than never. 🙂 Sharjah looks amazing! It looks similar to Abu Dhabi and Dubai in some manner but it has its own charm. Your photos have made it even more beautiful. I would really like to visit it some day. Till then thru the eyes of a few people who visited it. I’ve only been to Dubai and never got a chance to visit any Emirates. I’ve more fascination towards European architecture than Middle Eastern. But I enjoyed reading your post!